A bespoke digital platform to host and manage training and support materials. Actify, from Agile CIC, is a bespoke web application that hosts and manages a range of training and support materials. These are accessed by multiple organisations in the sports and physical activity sector in order to help them get people in the community more active. Agile CIC is a social enterprise that brings together expertise in the development of physical activity programmes and the use of digital technology. By using digital tech they strive to enhance the materials available to those working to get people more active. With this in mind, Agile CIC wanted a bespoke digital platform that could host and manage training and support materials for a range of organisations in the sports and physical activity sector. The team at Agile CIC identified 2 main problems that the sector was facing. The first was that although there were lots of training materials out there, generally these weren’t available digitally. The second problem was that these materials were all over the place and hard to find. 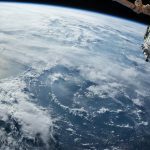 Actify is about bringing together relevant, accurate & trusted information from various public sector organisations into one easy to navigate digital platform – and then sorting these materials based on relevance to each individual user. The Actify application is predominantly driven by the dynamic content uploaded by the users themselves, therefore development was focussed around the CMS functionality of the platform. The solution comprises of different virtual spaces, called hubs, for the various organisations that will be on-boarded to the app. 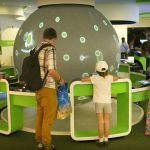 Each organisation hub allows the owners to create content within their hub in the form of ‘modules’. Modules can comprise of static information, media assets such as images and videos, as well as supplemental documents (PDF). Module creators also attach a series of meta-data tags that define the relevant activities, interests or goals associated with the module. Individual users of the platform also define their personal interests and goals, allowing the application to recommend content based on the user’s individual preferences. Each hub has it’s own tiered permission system, allowing content and actions to be restricted to hub members or to be shared with the public. Users can also build up a personal list of bookmarked content and followed hubs, allowing them to be informed of any new relevant content by the notification system. Hub administrators are provided with a way to tie individual modules together into blocks of related training and support materials. Each block is known as a ‘plan’ and outlines a recommended order in which to consume the module materials, to achieve a desired learning objective. Hub members may choose to organise sessions where they carry out a plan with other members at a pre-defined time and location. 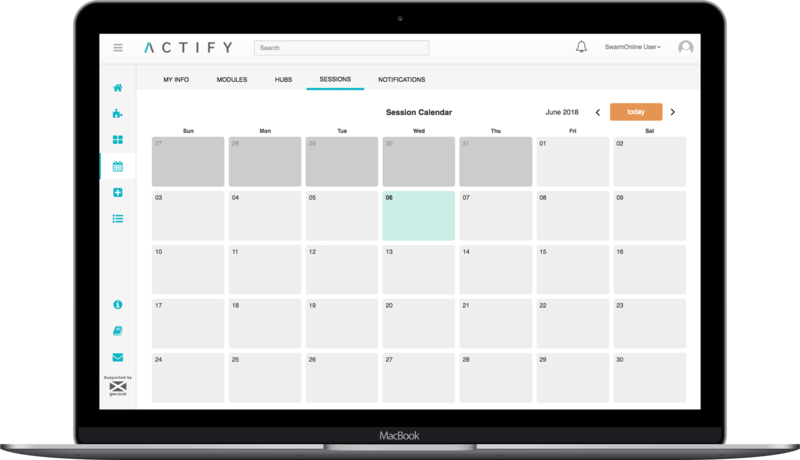 To facilitate this, the application provides individual users with a personal session calendar and the ability to provide feedback on each session after the event. To help measure the effectiveness of the activities, each hub is also provided with a analytics panel which provides data on the modules, plans, sessions and feedback associated with their organisation. In order to maintain the solution moving forward the site owners also have elevated access to the CMS aspects of the system. Allowing them to administrate content, users and hubs across the application. As well as viewing aggregated analytics data from all hubs. 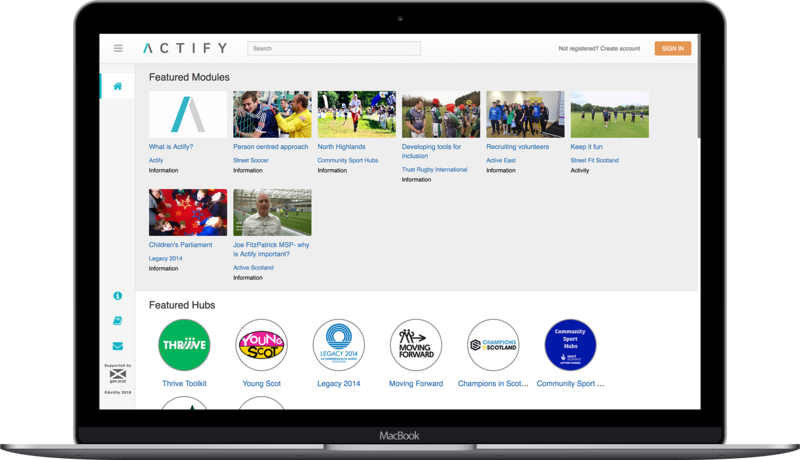 The Actify application enables staff and volunteers in the physical activity sector to increase their community reach, improve their communication facilities and save both money and time. Users are able to put their time and energy, previously spent locating and sorting resources, to better use – e.g. learning from the materials on the platform, encouraging healthy lifestyles across communities and inspiring people to become more active. We chose to work with SwarmOnline because of their innovative, leading outlook on technology. It allows us to compete more effectively in our sector as we are offering an app that has been built with the most up-to-date technology and this presents us with lots of opportunities for growth.